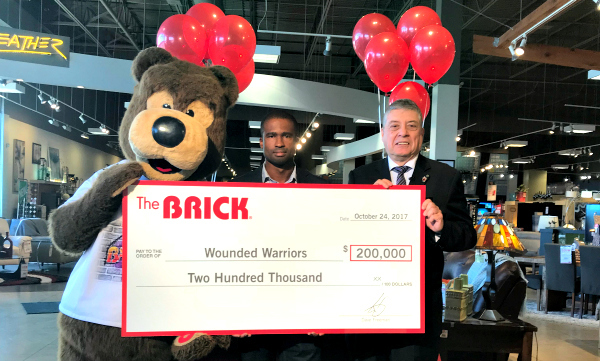 EDMONTON – Wounded Warriors Canada (WWC) has named The Brick as its top corporate sponsor for 2016, after the high-impact promoter raised and donated $200,000 to the national organisation, which provides a wide range of programs and services for active and retired members of the Canadian Forces. The funds were raised over the course of 2016 during the retailer’s Proudly Canadian Made furniture promotion, which was held four times over the course of the year. A portion of each made in Canada furniture purchase was donated to Whitby, Ontario-based veterans’ organisation. In addition to the Proudly Canadian Made furniture promotion, The Brick also donated funds as a company, making it one of the organisation’s top corporate sponsors for 2016. “Today we celebrate the Brick, a Canadian company whose ongoing vision and leadership leverages its position as a leader in the sale of Canadian made furniture into an ongoing commitment to supporting those veterans, first responders and their families who are injured as a result of their service to Canada,” WWC national program director Philip Ralph said. The Brick – one of two banners operated by Leon’s Furniture Limited, this country’s largest furniture, mattress and major appliance retailer – and Wounded Warriors Canada began their partnership in 2014. Vice president of legal affairs and corporate secretary, Greg Nakonechny told Home Goods Online that The Brick began supporting WWC at the suggestion of an employee who was a retired Canadian Forces member. He also indicated the retailer is on track to at least match the $200,000 donation in 2017 and is already planning the promotions as part of its 2018 calendar. The Brick also actively supports the Children’s Miracle Network – contributing about $1 million annually – which raises funds for children’s hospitals across the country. Wounded Warriors Canada is a non-profit organisation that helps Canadian Armed Forces members – whether regular force, reservists or retired – who have been wounded or injured in their service to Canada. Through a wide range of programs and services, it helps find solutions where gaps have left soldiers in need. Currently, its primary focus is on mental health and, particularly, the staggering impact of Post-Traumatic Stress Disorder. Overall, however, its mandate is to help any veteran in need as they transition to civilian life.